After eight enjoyable years I am closing the shop. I wish to thank all my customers both past and present. I aim to load a lot more items to the website. 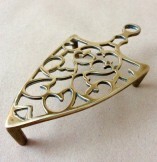 Victorian cast brass Iron trivet hearts and shield decoration. 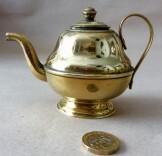 Miniature brass teapot ornament or child’s toy. Miniature brass kettle possibly for a child. Pair of Regency or William IV Cut glass salts. Early 20th century blue glass Hyacinth vase. Edwardian Wooden Obelisk desk thermometer with stamp drawer. 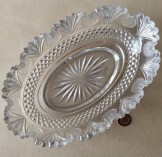 Antique Victorian cast brass iron stand or trivet. Good vintage brass hand two part door knocker. 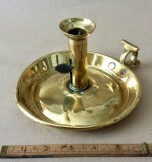 Victorian Brass students candle lamp base. 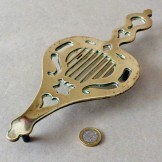 Good rectangular pierced brass trivet c1900. Monkeys tail wrought iron goffering iron on tripod base.